Federal regulators decided today to reduce their role in permitting the Lake Powell Pipeline, the largest new proposed diversion of the Colorado River. Since 2008, the Federal Energy Regulatory Commission (FERC) has been the lead permitting agency for the 140-mile long, $3 billion Pipeline. In their monthly meeting this morning, FERC clarified they were not the right agency to permit a water diversion of the Colorado River, since they are an energy regulatory agency. The Utah Division of Water Resources has been retreating from the costly power generation facilities of the Lake Powell Pipeline because they have no way to repay Utah taxpayers for the very costly Pipeline. The Pipeline would transport nearly 77 million gallons of Colorado River water a day to Washington County in Southwest Utah where residents use 325 gallons per person per day, according to the FERC application. Amid widespread drought in the Colorado River Basin, Utah is pursuing the massive 140-mile pipeline regardless of the reliability of Colorado River flows and the impacts on downstream states. 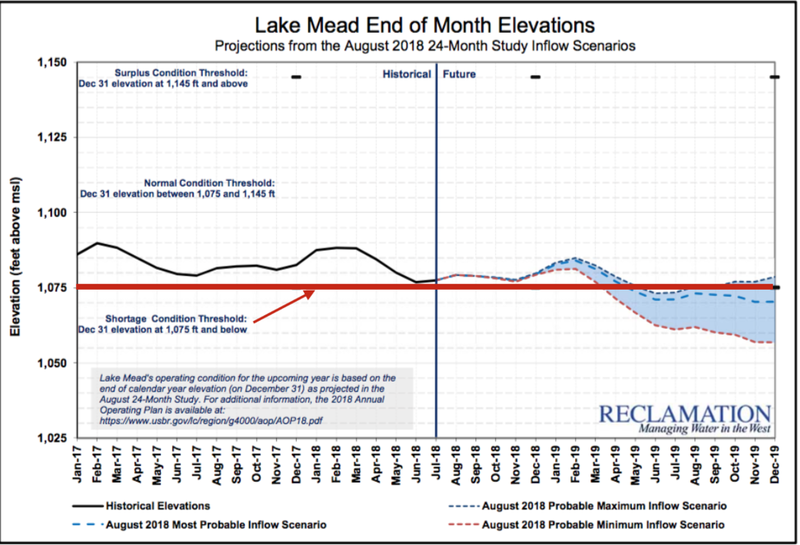 The Bureau of Reclamation recently announced there was a 90% chance of shortage in the Colorado River next year, which will occur if Lake Mead drops below 1,075 feet above sea level. This triggers a Tier 1 shortage where Arizona will lose enough water to supply 2.4 million people a year, while Nevada will lose enough water to supply 96,000 people a year. If water levels in Lake Mead drops below 1,075 feet above sea level, a federal shortage is declared, forcing water users in Arizona and Nevada to walk away from their water supply.